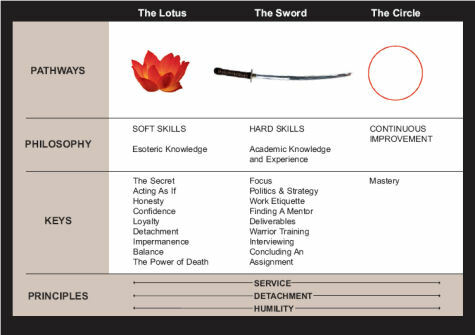 As depicted in our logo, The Three-Fold Path leads to mastery through the evolution of soft skills (the Lotus), professional skills (the Sword), and a commitment to continuous improvement (the Circle). Together, these pathways lead to new levels of extraordinary individual achievement. On The Three-Fold Path to Mastery, you will learn specific areas to focus on within these pathways to evolve personally, as well as professionally. The Three-Fold Path to Mastery not only teaches ways to deliberately foster and embrace great personal and professional evolution; this philosophy also shows you how to ride these waves of change with joy. Click any of the links on the left or below to learn more about the individual pathways and the Satori Sciences logo.